My friend Nathan, a U of M alum, told me to have lunch at Zingerman’s delicatessen as it’s an Ann Arbor icon. I had the best Reuben of my life today. There are two types and I had the Brooklyn style, which means pumpernickel and pastrami instead of the regular with Jewish rye and corned beef. 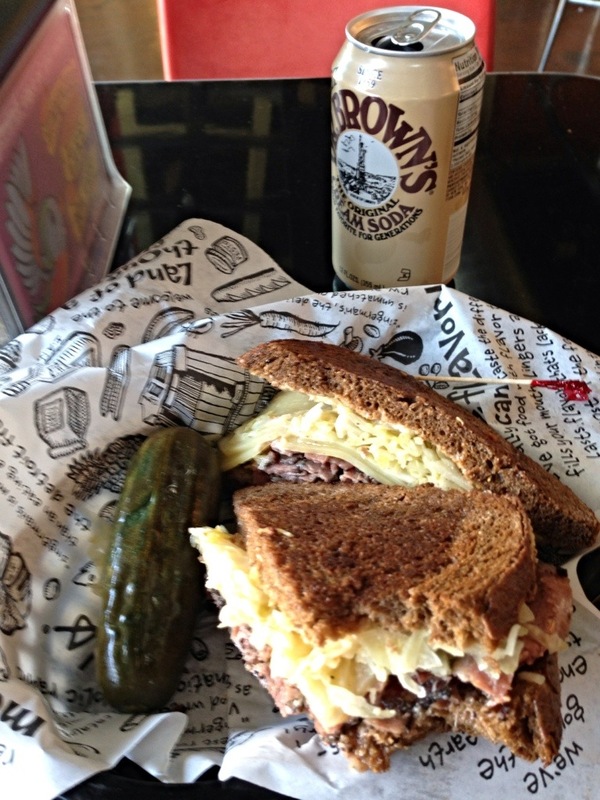 The pastrami was tender with a peppery punch. I ordered the small and it was just the right amount of everything and not marinated in Russian dressing. In New York it’s hard to find a place that serves a Reuben as a realistic sandwich. It always comes with way too much everything and is served open face. I don’t want to eat it with a knife a fork. Yes, being served an open face sandwich is one of my life’s problems. The staff were all uber efficient, cute and eager. Plenty of seating outside and today was GawJus. When I thanked Nathan for the tip he told me he’s never been there. I get that. I’ve never been to the top of the Empire State Building. Zingerman’s is Ann Arbor’s Empire State Building.